Sure, it’s a demo, but it’s still Forza Horizon 4 and we’re not going to pass up the chance to dig in and see how it performs especially since the game has gone gold and this is it’s release state. This is a game I’ve personally been looking forward to for quite some time, even to the point that I picked up a subscription to GamePass, heresy I know but the PC games are good so there’s that. 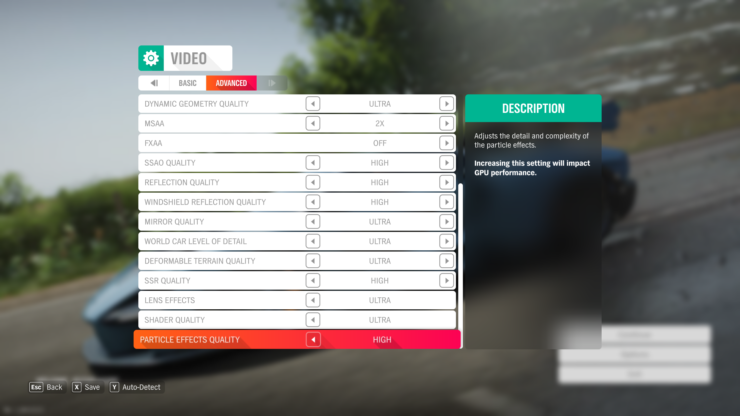 Forza Horizon 4 brings back it’s excellently polished engine and continues it’s reliance on DX12 for the PC to pull the most from hardware. 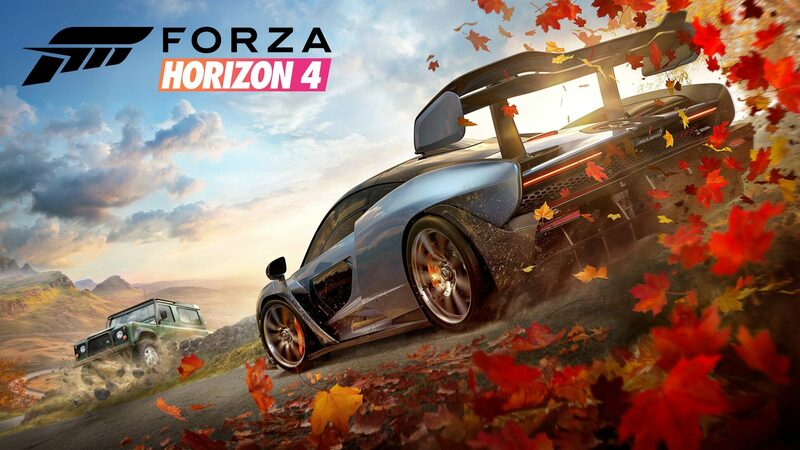 Early on this was not exactly something to praise as Horizon 3 launched with quite the stutter fest. 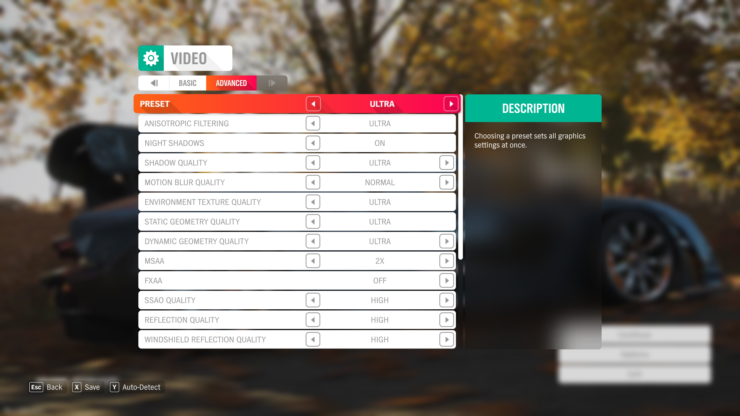 But that’s the past and we’re on to the bright high resolution future of Forza Horizon 4. Testing the game was a pretty straight forward process thanks to a built in benchmark that is very representative of normal in game performance. 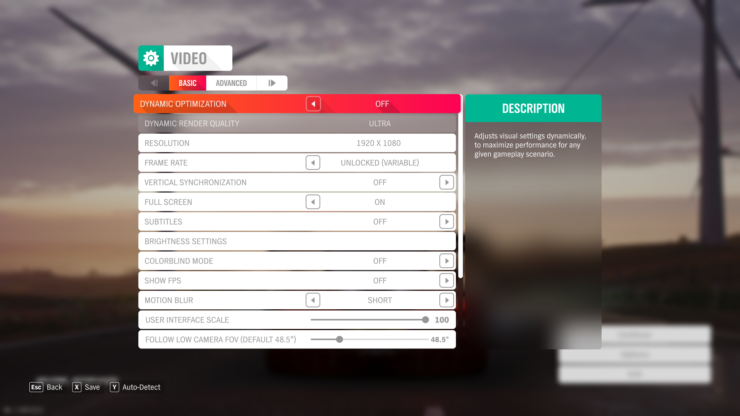 The big catch is this game has a ton of options and quite a few variables so we had to make sure to disable those with each restart and hardware change ultimately settling with the non variable ‘Ultra’ preset. There are settings that will allow you to take things to the extreme, well that’s what they call it anyway, but we’re sticking to a solid preset for today. Testing took place at 1080p, 1440p, and 4k taking the average of 3 runs to account for margin of error, which there was very little between runs. The fact that it is both a UWP title and DX12 means that old world methods of extracting performance beyond what the benchmark spits out at the end. We incorporated a combination of OCAT and an in house spreadsheet that extracts the Average Framerate as well as the 1% and .1% lows to better represent what the experience is in game. Below we’ve listed the settings used as well as a list of hardware we tested with and the drivers used. 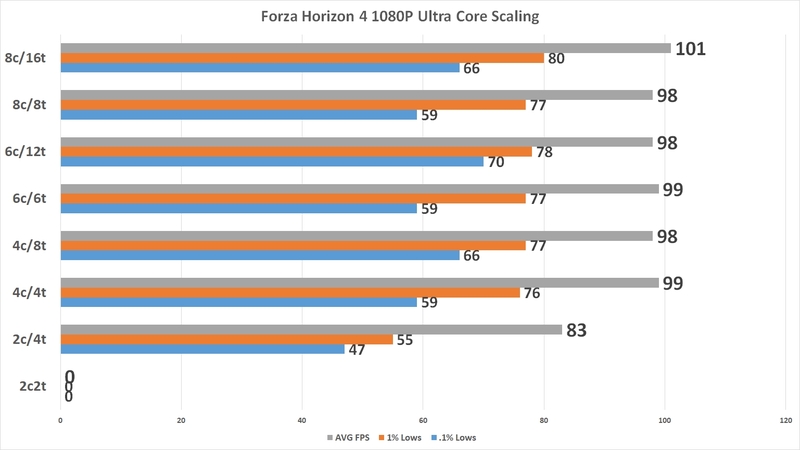 Testing how performance scales based on the number of cores and threads used on Ryzen helps identify the point of diminishing returns when it comes to gaming on higher core count mainstream parts. For this test we paired the Ryzen 5 1700 with the GTX 1080 all run at 1080p Ultra. We paired these not because it’s the fast since it isn’t, but because it had the tightest spread of the high performance GPUs and should have been sensitive to performance changes on the CPU side. 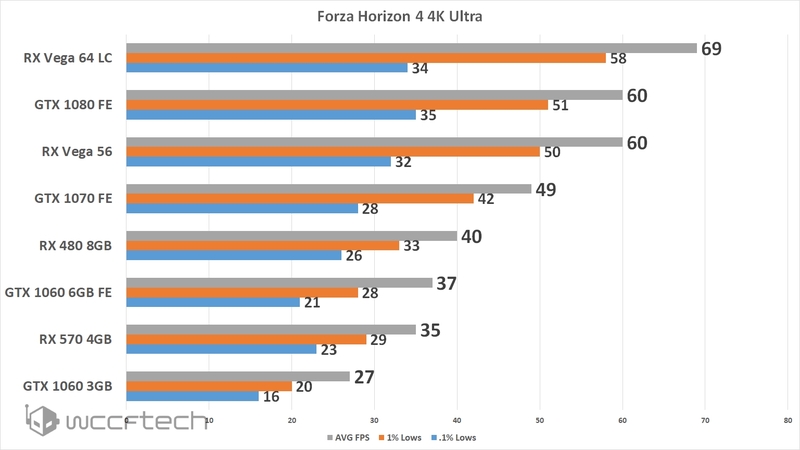 Looking over the results show that Ryzen is extremely consistent here with configurations using SMT performing better than those that don’t. Clearly 2 cores and 4 threads isn’t quite enough to kick this game to the same level as even the 4 core 4 thread configuration and it wouldn’t even launch with only 2 cores active, sorry Celeron users. So, ready to race? Sure looks like. This should be a game that most people aren’t scared to pick up. 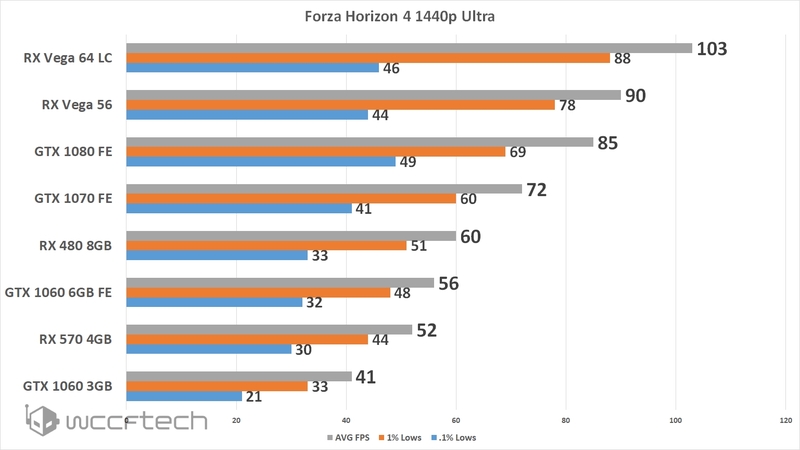 Radeon has once again ran away with performance on another Forza title, showing benefits from the console world where this game was born and bred. The real winner here is definitely the RX Vega 56, so take a victory lap Vega. 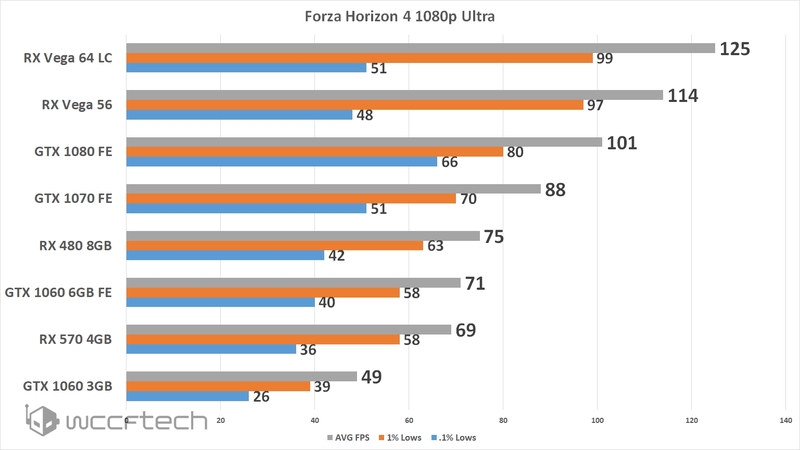 But overall performance from both Radeon and GeForce was more than acceptable with a great gaming experience to be had. Looking over the CPU shows that very few people should be concerned about it either. I was actually hoping to see more benefits from higher core counts like we saw with Monster Hunter: World, but I’m not going to complain about solid optimization. I was hoping we would have had our Coffee Lake test bench finished off in time for this one and the Shadow of the Tomb Raider look, but we’re still waiting on the boards. That all said, I can’t decide whether I want to burn rubber or raid tombs but either way this fall is already shaping up to be a PC Gamers dream come true! If you’ve got the game demo downloaded share with us your results and hardware configuration so we can get a wider view of what kind of performance we’re all getting.